ENJOY INDEPENDENT FILMS, SHORTS, WEB SERIES AND VISUAL ART FROM THE BLACK DIASPORA. Sit back and enjoy 24 hours of exclusive black films, emerging web series, visual art, and shorts! See works from emerging and popular film makers, directors, and visual artists. We’re dedicated to delivering the best entertainment news along with the latest commentary to keep you up to date 24/7. So c’mon, sign up today and enjoy early bird benefits and a lifetime of quality entertainment! Benefits of Early Bird Sign Up! - Never pay subscription fees for premium access. - Stay in the know with email updates and/or join our newsletter. - Be heard, provide your feedback as we grow! Connect on Facebook, Instagram, and Twitter to get a taste of Jaro. Stay tuned for Exclusive News, Launch Date, Giveaways and More. 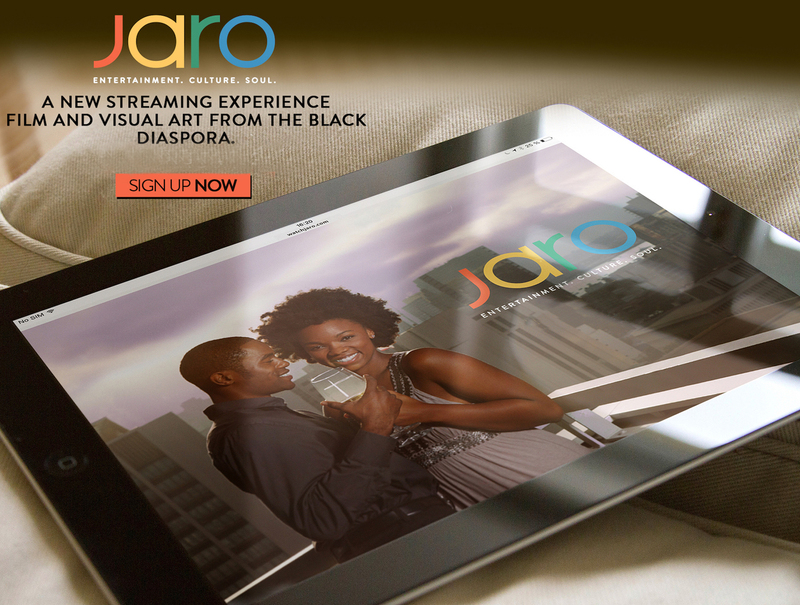 JARO is a premiere on-demand platform curating independent films, emerging web series, short films and visual art appealing to African American and urban-influenced audiences. HERE ARE 6 REASONS TO SUPPORT JARO! Our vision is a bazaar-like ecosystem that creates value for global customers, content creators, and sponsors and builds into the communities we serve. Filmmakers, visual artists, and photographers should be paid for their work, talent, and skill. We are breaking new ground with a hybrid content acquisition model that supports both traditional upfront licensing and back end revenue sharing royalties. Our royalty payments are distributed from a pool that is based on a percentage of our revenues. These payments are distributed regularly based on the relative popularity of your content. We will build our audience by investing in marketing best practices that include a 360 marketing plan that incorporates state-of-the-art SEM (Search Engine Marketing) and social media techniques. If you sign up for royalty payments, any work you put towards promoting your content may turn into more money in your pocket since we pay you in proportion to the relative popularity of your content with the Jaro audience. After a domestic launch, our Jaro platform will quickly expand to reach a global audience. We will have the ability to block geographic areas. If you have a need to restrict access in a specific country, we can do that for you. If you are a royalty fee content creator, you’re always free to explore additional outlets for your content. Our team consists of independent artists, filmmakers, film festival organizers and entrepreneurs. Collectively we bring an artistic and business perspective to everything we do. We know just how hard it is to finance and create a quality film, then find a fair distribution deal that makes all the good work pay off. JARO is committed to creating Win, Win, Win opportunities for our Content Creators, Advertisers, and Audience. Pre-launch content review begins now! Submission is easy, free and takes less than 5 minutes to secure your spot. Follow these easy steps to enroll! SIGN UP FOR JARO TODAY!